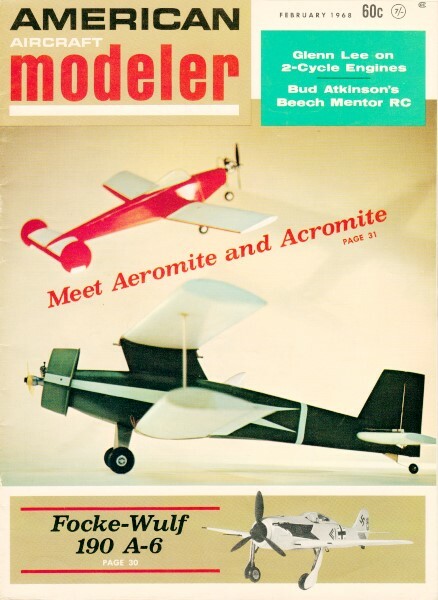 Website visitor Lincoln R. wrote to ask for a scan of the 3-view for the Taylorcraft that appeared in the February 1968 edition of American Aircraft Modeler. This particular 1941 vintage Taylor was owned by well-known scale aeromodeler Don Pratt. It is still in pristine condition three decades after being manufactured. Don built a 1/4-scale model of his own airplane. Though 13 years have passed since the last T-Craft was produced, it is still remembered as a classic. Call it what you will - Floater, Cloth-Moth, Barn Door or Porch Swing - it was a favorite. In January of 1937 Gilbert Taylor and Bill Piper Sr. parted company. This combination of airplane design genius in the former and hard-headed businessman in the latter had produced the immortal Cub and the highly successful Taylor Airplane Company that built it. Later, the two men decided to go their own ways. Piper controlled the greatest number of shares of stock so Gil Taylor went off to establish a factory that could produce airplanes according to his own design theories and ideas. 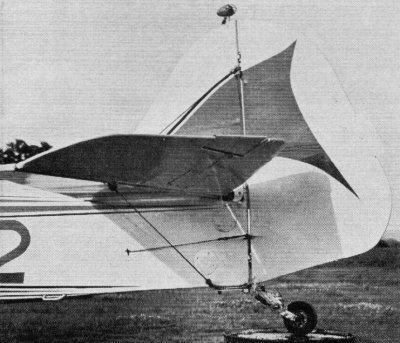 The split had come over a new design lightplane that Gil Taylor saw as the logical successor to the Cub. Though the Cub had been his brainchild, Taylor realized that the design was now nearly nine years old. Much had developed since 1929 and he wanted to build a plane that would take advantage of the new refinements in aerodynamics that had been discovered in the interim. Piper saw that the Cub was a proven successful seller and he wanted to ride with it as long as it remained so. By mid-March of 1937 Taylor had gained financing and had a factory building in operation at Alliance, Ohio. The new company he formed became known as the Taylor-Young Airplane Co., and the new design airplane was called the Taylorcraft. In order to avoid confusion of the public by the similarity of the names of both companies, Bill Piper changed the name of the older organization to Piper Aircraft Corp. From that time on, the airplanes manufactured by that company would be known as the Piper Cub. Cowling detail for the scale modeler - spinner, cooling in­takes and trim strips are chrome. Directly below center air intake grill is the oil cooler; below that is the' exhaust stack. Early T-Crafts featured full-round steering wheels similar to automobiles instead of the more common stick controls. Cockpit detail shows the later, more compact half-round type of wheel. The elevator trim tab is adjusted from the cabin; a fixed tab gives rudder trim. Castor-type tail wheel is linked to the rudder and is leaf-sprung. Note fuselage handhold at left and below "two" numeral. 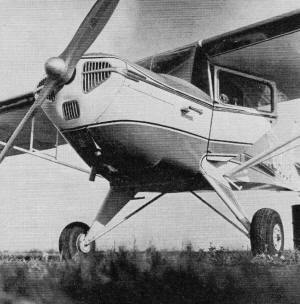 The new Taylorcraft proved indeed to be a great improvement over the Cub. Such refinements as fairings on the wing struts and gear legs, NACA 23012 wing airfoil, and a better streamlined fuselage shape raised the cruising speed from the Cub's laborious 62 to a more impressive 82 mph. The Cub's dependable Continental 40-hp. 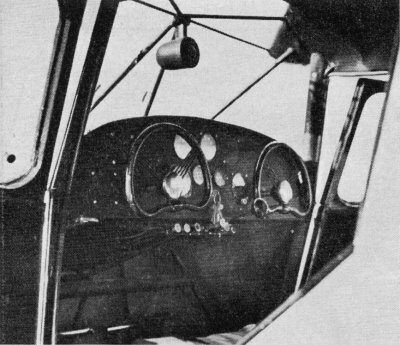 engine was retained but the tandem seating of the older airplane was abandoned in favor of the cozier and more sociable side-by-side arrangement. The new design used the same open type engine cowling, with the cylinders hanging out in the cooling breeze as had been fitted to the Cub. The control sticks however were exchanged for neat little 12-in. diameter control wheels on shafts that protruded from the instrument panel. These were full-round and resembled the steering wheels used on automobiles of the period. By 1941, when the subject of our three-view drawings was built, the T-Craft had undergone a number of effective refinements. These resulted in a considerable increase in speed, general performance, and comfort for the pilot and passenger. The T-Craft was to go through a series of further minor model changes and refinements in later years. In 1946 the vertical fin and rudder were enlarged to improve directional stability, and in 1952 an 85-hp Continental powered version was offered to the public. Most T-Craft fanciers among the antique airplane enthusiasts contend that the 1941 Deluxe model is the true classic of the breed. It is indeed now the rarest and most difficult to find of the hundreds of Taylorcraft products that may still be seen on the nations private flying airports. 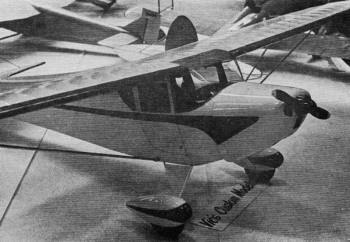 Like most of its contemporaries, the Taylorcraft Co. did not survive the post World War II airplane market depression. They ceased production altogether in 1954 and have not produced airplanes in Volume since the 1948 model year. The Taylorcraft can make an excellent subject for a scale flying model. The full-size craft has good proportions for direct reduction except for the vertical fin and rudder of the prewar models which would require some enlargement. The dihedral would have to be increased, of course. The glide ratio of the full sized T-Craft is something more akin to that of a secondary sailplane than a powered craft, and that characteristic carried down into the model could certainly increase duration in free-flight form. Best of all, there are still a lot of T-Crafts around, and a Sunday trip to an outlying airfield, armed with your box brownie, will usually bring you face to face with several of them so that you can collect photos of full scale details for your proof-of-scale portfolio. 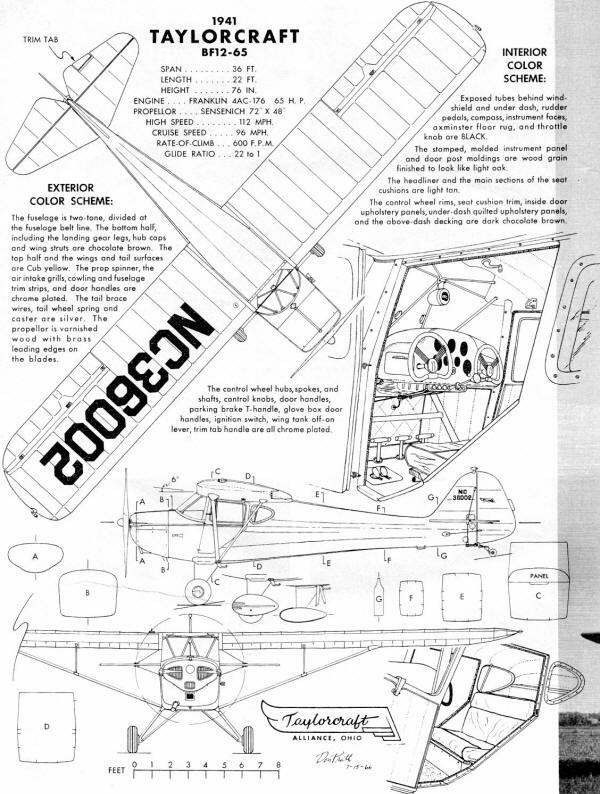 Many hobbyists have a special weakness for giant-sized flying models, and when it comes to large scale jobs, the Taylorcraft has a hypnotic attraction. The photo here was made at last winter's Toledo Weak Signals RC Conference, where Vic's one-fourth size T-Craft was a highlight of the show. In fact, it so enthralled your editor - who recollects fondly the real machine as well as earlier "large economy-size" kits of the past - that he decided to risk this plug (unsolicited) for Vic's Custom Models. Unfortunately, the editor was soundly scooped by the Check List department editor who reported in the January issue on a sample kit, delivered by a Lockheed Hercules to the home office. Quoting his insubordinate prose, this 1946 version of the T-Craft spans nine feet with a chord of 1 1/4, and leaves the ground serenely-urged on by "at least a .60." We noted that, if ailerons are installed, each should have its own servo - which gives you the drift of things. You haven't lived until you've hefted those bulkheads - we've seen houses that seemed smaller. For the guy who loves to build (it is just bigger not more difficult), to finish, who wants realism and smooth flying, the design is a smorgasbord of all that's delightful. We do have a bone to pick with those - and this was commonly claimed - who darn the big ship as a floater. Many old-timers that combined acres of area with clean lines - Piper Supercruiser, PA-11, etc., as well as the T-Craft - could be brought down on the near end of the runway (!) by either holding the nose up for increased sink, or just getting the wheels on the ground in a wheel landing. Even the model will probably float into the next county if you decide to land three-point with good flying speed. Nose up? Just hold the fuselage line parallel to the horizon. It worked on the real one, and maybe it will work on Vic's gem of gems. Just don't push it too much on a gusty day. ENGINE ................ FRANKLIN 4AC-176 65 h. p.
PROPELLOR .......... SENSENICH 72" X 48"
The fuselage is two-tone, divided at the fuselage belt line. The bottom half, including the landing gear legs, hub caps and wing struts are chocolate brown. The top half and the wings and tail surfaces are Cub yellow. The prop spinner, the air intake grills, cowling and fuselage trim strips, and door handles are chrome plated. The tail brace wires, tail wheel spring and caster are silver. The propeller is varnished wood with brass leading edges an the blades. Exposed tubes behind windshield and under dash, rudder pedals, compass, instrument faces, axminster floor rug, and throttle knob are BLACK. The stamped, molded instrument panel and door past moldings are wood grain finished to look like light oak. The headliner and the main sections of the seat cushions are light tan. The control wheel rims, seat cushion trim, inside door upholstery panels, under-dash quilted upholstery panels, and the above-dash decking are dark chocolate brown. The control wheel hubs, spokes, and shafts, control knobs, door handles, parking brake T-handle, glove box door handles, ignition switch, wing tank off-on lever, trim tab handle are all chrome plated.